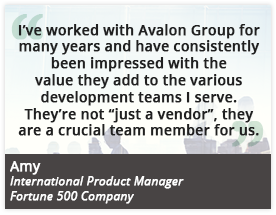 A Fortune 500 company asked to Avalon Group to update existing installation instructions with color photographs of a product, to replace the current black-and-white wireframe drawings. Once the product was received at Avalon Group, our Graphic Design team went to work shooting product beauty shots in our in-house photography studio. Within a few days, the instructions were updated with high-definition full-color photographs, enhanced to show the intricacies of the product’s functions. The high-impact illustrations were featured in the company’s trade-show presentation and the company asked Avalon Group to update the entire line of installation instructions with full-color photographs.